The term “food poisoning” has been used to refer to a foodborne illness. This can be due to consumption of food that contains a toxin, chemical or infectious agent (such as a bacterium, virus, parasite, or prion). Most commonly, foodborne illnesses are caused by Norovirus or the bacterial types Campylobacter, Clostridium perfringens, and Salmonella. Symptoms of food poisoning may arise from the gastrointestinal tract or in some cases may be more widespread and involve other body systems. The most common symptoms are vomiting, watery diarrhea, and abdominal pain and cramping. Vomiting and diarrhea may cause significant fluid loss, leading to symptoms and signs of dehydration. Abnormalities in electrolyte balance can affect the function of a number of body systems. Other associated symptoms can include lethargy, rectal bleeding, or fever. Symptoms of food poisoning sometimes depend on which organ system the poison effects; for example, the neurological system may be altered by neurotoxins like pesticides and botulinum toxin. When a group of individuals experiences similar symptoms after eating or drinking similar foods, food poisoning may be suspected. Some people are at higher risk to develop food poisoning. They include children, older adults, pregnant women and people with medical conditions like diabetes, liver disease, kidney disease and anyone with immunodepression. Viruses are the most frequent cause of food poisoning in the U.S. The next highest causes are bacteria. 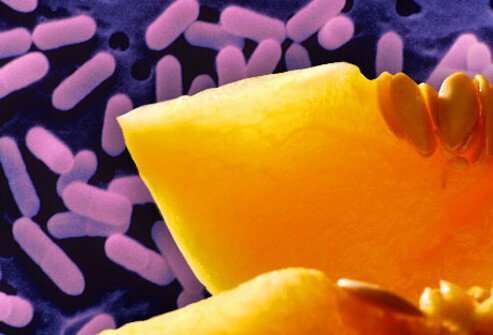 About 31 viral and bacterial pathogens are responsible for almost 9.4 million diagnosed food poisoning illnesses per year; about 48 million food poisoning cases are unspecified (undiagnosed). Yearly, about 128,000 people are hospitalized and about 3,000 die from all causes of food poisoning. Infectious agents comprise the largest category of food poisoning, but as seen from the above top categories, viral infections comprise the bulk of infected patients but are far less likely to cause hospitalizations and deaths than Salmonella bacteria. Because the bulk of "unspecified" causes is probably similar to the makeup of the diagnosed causes, this grouping of viruses and bacteria is considered to be the main causes of food poisoning in the U.S. There are many toxins that can cause food poisoning. Some are produced by bacteria on or in food and others are produced by plants and animals/fish or other organisms that are ingested. There are many plants and animals/fish that can be poisonous under certain conditions but they are encountered infrequently or under special conditions. Even though there are many bacterial, plant, and other toxins that can be ingested with food and water, they are usually limited to relatively small outbreaks. Certain chemicals are considered toxins that can cause food poisoning. Although there are over 80,000 chemicals used in the U.S., only a few have been well studied. While most do not enter into foods, some do and cause food poisoning. An example of such a chemical is mercury, found in drinking water and in fish such as tuna and marlin. Other examples of chemicals that can be toxic if enough contaminates food and water are pesticides, polychlorinated biphenyls, and lead. The causes of food and water poisoning are numerous. This brief listing of causes should suffice as a framework to begin more detailed studies of food poisoning. If viruses or bacteria cause food poisoning, it can be contagious.